Army Placement Agency(APA) launched its interactive web portal www.apa.co.in at an impressive ceremony at South Block in New Delhi on Tuesday, 28th June 2005. 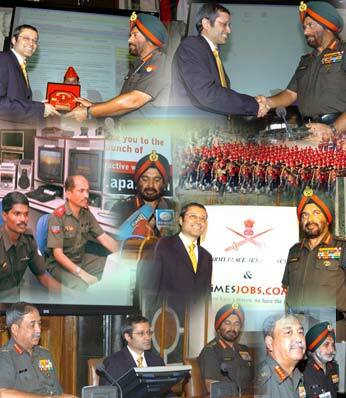 The website was officially inaugurated by General J J Singh, Chief of Army Staff by the click of a mouse. Present at the occasion were Vineet Jain, Managing Director of The Times group, Lt General B S Thakur, Vice-Chief of Army Staff, Lt General Mohinder Singh, Adjutant General and a host of other dignitaries and guests. After inaugurating the web-site, General Singh said, “It’s a great privilege for me to launch the Army Placement Agency Interactive web portal. It has been our experience that an average retired person is desirous of a job only in the proximity of his place of residence after retirement. In order to provide greater awareness about Army Placement Agency and the easy availability of large number of Ex Army personnel at different locations to the desirous employers, there was an undeniable requirement of using the information technology avenue. “Advancements in the fields of information technology and E – communication have made wide dispersal and distances irrelevant as also sharing of information very easy. I am sure, the APA Web portal which is going to have an all India identity and reach will benefit a much larger number of ex-servicemen including those who reside in the far flung areas. The desirous Ex Army personnel on the lookout for suitable jobs will also have the advantage of accessing jobs displayed on Timesjobs.com”, he added.